This article explains the power of 2.0 (two dot zero) ideals, why 'Mobile Web 2.0' centres on the unique value created by "mobile metadata" and why Eric Schmidt the CEO of Google believes that the ownership of mobile metadata will create more shareholder value than search! Every CxO seeking to deliver a convergent solution should read and debate this article as it impacts: mobile operators, handset manufactures, equipment supplies, platform supplier, application developers, venture capital, advertisers, consumer Brands, media companies and agencies. 2.0 is an umbrella for practical thinking that centres on the network effect, collective intelligence, the long tail, wisdom of crowds, clans, clubs and all other manor of social ideals. 2.0 is about the evolution of early Web business models which centred on cost reduction and zero cost of customer acquisition. Paypal, E-bay, Amazon, Last Minute and Google have changed our traditional methods of finding information, booking holidays and selling our services. Whilst we see the direct effect on ourselves, there is need to understand how the change impacts on our children, our parents, our suppliers, our customers and our customer's referrals. This wider impact is about the 'network effect' and the value comes from ownership of the underlying data, the metadata, welcome to Web 2.0! Web 2.0 technology brings the feel of big company data analysis within the cost range of the SME. It provides the data that the 'shop keeper' always had, that enabled him to welcome Mr. Smith and recommend something different today. Moving from 1.0 to 2.0 is about the move from separation, isolation and solitude to relationship, engagement and conversation. Tim O'Reilly [O'Reilly Media] described the 7 principals of Web 2.0 in an article published in October 2005. The article focussed on the Web as a platform. The progressive thinking that underpins 2.0 has now extended across most sectors and business practices including advertising 2.0, CRM 2.0, Enterprise 2.0, TV 2.0, Mobile and many more. Irrespective of use, 2.0 epitomises a business model that will be built on data, identity, trust and connection. 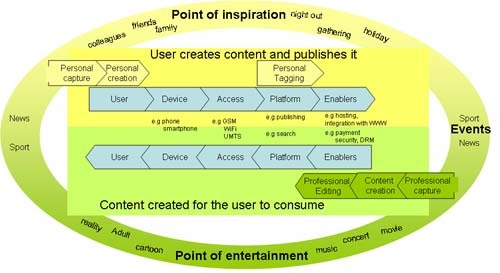 Two services as shown in table 1, have typified Web 2.0, User Generated Content (UGC) and social networking. An idendification of who the creator is, reputation. Validation of friends and connections. Every call we make is about someone creating and someone consuming and then swapping roles. Every SMS we send is about creating, every SMS we receive is about consumption. Consumption is about one click, switch on the TV, buy on Amazon, read your message, receive a call. Creation is many clicks, dial a number, create an SMS and post a blog. YouTube, Flickr and blogs are a recognition that humans are as much creators as we are consumers. UGC technologies have enabled the masses to put their creations into the public domain. We can create and this enables users to entertain themselves outside of the linear broadcast TV model; creation of content has become the mechanism of entertainment itself. Whilst the Web consume model, balanced by new UGC and social networking models has seen massive growth, the mobile sector will soon over-take the Web as a platform for creation and social networking. The mobile phone has the advantage that it is always available and content can be created at the point of inspiration; this is the balance to consumption, the point of entertainment. As a mobile industry, we focussed on the consumption model, which to a greater or lesser extent justified the 3G business models via payment for services, applications and content. The creation side (photos and video) and taking content from the mobile to the Web has emerged as a service that users exploit. Further, creators will put up with a poor user interface to engage, as it is their creation they will spend the time to master the processes. Take up of consumption and creation within the mobile context is predicated on issues discussed at length within the mobile industry; battery life, handset constraints, UI, data pricing and access speeds. However, neither creation nor consumption are unique to mobile! it is available for payment, either as a replacement or complement to plastic and cash. Which form and what limits are furiously debated by commentators who are either protecting or seeking to exploit. Value added mobile business models were built on the idea that the user would consume and pay for content and applications. Progression of technology has allowed the Web to become mobile, bringing to the mobile service provider the possibility of advertising revenue. New and additional value could therefore be accessed utilising the same ideas that have driven Web 2.0, insomuch as the mobile can mimic the Webs' focus on clicks within the application or browser to deliver the data and information for personalisation, context and advertising revenue. These clicks are known as our "Digital Footprint" and are a driver of value creation. Digital Footprints come from mobile, Web and TV - the digital metadata of who we are, the true value and why the ownership of this data is the battle ground to be won and lost. The reason why Eric Schmidt wakes up thinking "mobile, mobile, mobile" before he looks at his email or worries about the value of Double Click or improving a search algorithm because users spend least time on TV, some on the Web but the mobile is attached personally 24/7! However, even if mobile based form factors will be the predominant method of Web access globally, this thinking has limited the real value and uniqueness of mobile, as it has constrained the possibility of data collection to clicks from within the mobile browser or application. Who - who the user is doing activities with. The value creation opportunity comes from the ownership of these metadata categories, as the owner will be able to undertake the analysis and exploit the trends and connections. It is unlikely the user will ever know, but the deliverable will deliver what the industry has promised. Therefore, technology that delivers this unique "mobile metadata" e.g. unique metadata to our Digital Footprint, will become an essential decision determinant in the choice of any expansion of technologies. Whilst it is recognised that some functionality could be passed to the device, the existing constraints of battery life, size and processor power may highlight the value a network technology that delivers these capabilities has. Whilst the user will not care about the technology choice, they will if the value proposition is different! If a service provider can deliver more advanced services to the user, at a lower cost with improved performance; it is likely that such a service provider will reduce churn, improve margin and increase market share. There is a wide range of opportunities to create value for companies in the expanding mobile value chain and eco-system, however, emerging business models will be based on different economics. "Mobile Web 2.0" is about the uniqueness of "mobile metadata" in relation to the Digital Footprint and is not about the extension of the web to the mobile. 2.0 thinking has a significant impact on network access choice, middleware platform functionality and device capability. In the past 60 months, Gerbsman Partners has been involved in maximizing value for 36 Technology and Life Science companies and their Intellectual Property and has restructured/terminated over $720 million of real estate executory contracts and equipment lease/sub-debt obligations. Since inception, Gerbsman Partners has been involved in over $2.1 billion of financings, restructurings and M&A transactions.